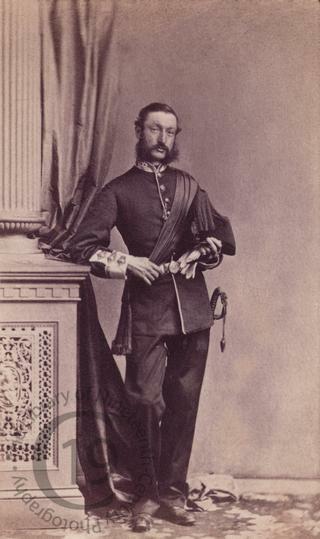 A carte-de-visite portrait of Captain George Maunsell. George Maunsell was the son of Robert George Maunsell and his wife Mabella (née O'Grady). He gained the rank of Major in the service of the Honourable East india Company Service. Major Maunsell died in December 1887. From an album compiled by his sister, Louisa, who was successively the wife of the 6th Earl of Seafield, Major Godfrey Massy and Lord Henry Loftus. Photographed by Edward J. Harding of Cork.